Execumat Chairmat is the thickest carpet chair mat made. This chairmat is 1/4" thick and made for heavy duty high pile carpet. 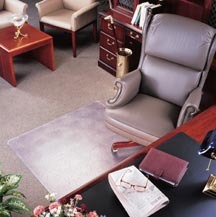 The execumat chairmat has a nice texture which keeps your office chair on the mat. The carpet grippers on this mat are more like bumps to protect your carpet. This chairmat come with a lifetime warranty. Thickest Chairmat and made in the U.S.A. If you are tired of thin chairmats, try the execumat thickest office chairmat made. These chairmats can handle the thickest carpet and eliminate most of your dishing and dimpling chairmat problems. Thickest Chairmat made at 1/4" thick, made for heavy duty use and carpet. Chairmat comes with a lifetime warranty and ships out fast. Fast free shipping. ChairMat.com Rating: 5 out of 5 based on 354 reviews. Learn more about ChairMat.com at Google +!